Why is there so much attention on bots now? What’s the business model for bots? What does the bot landscape look like? Bots are software programs that perform automated, repetitive, pre-defined tasks. These tasks can include almost any interaction with software that has an API. These tasks can range from making dinner reservations, to getting an update on a support request, to checking competitors’ prices on their websites. You’ll notice that the definition of bots does not necessarily include the concepts of artificial intelligence (AI) or machine learning (ML). As of 2016, it seems that most bots are discussed in a context that almost assumes that the bot is enabled by AI and/or ML. But that’s not necessarily the case. There are lots of different kinds of bots, and some bots are just dumb programs that execute brute force work (e.g. crawling web pages). Other bots are essentially just elaborate decision trees, where the user navigates based on a limited range of choices. So it’s accurate to say that some bots leverage AI & ML, but not all bots do. Bots at this stage of evolution aren’t really AI; they’re logic. They’re “if this, then that” with a human voice layered on top. They’re streamlining common support cases, explaining frequently asked questions, scheduling appointments, and completing orders. With the right framework, any good writer should be able to “botify” a problem or a use case for a company. The range of bot capabilities is huge, since bots can interact with so many different kinds of software. These kinds of bots are good proof-of-concept, if not very compelling from a user experience perspective. The real value of bots is in their agency. That is to say, bots can go out into the world and do stuff for you, by interacting with other services on your behalf. A perfect example would be a Slackbot that files Jira tickets for a software development team, or allows everyone on a distributed team to participate in a daily Scrum meeting via quick Slack updates. Because there are so many possible use cases here, especially for businesses, we expect a massive increase in these kinds of bots that are Transactional in nature – passing data back and forth between separate platforms. If you’re interested in an in-depth look, you can read this article about all the different kinds of bots. Bots can live and work in lots of places, including the internet at large (search engine spiders), messaging apps (Facebook Messenger, Skype, etc), or on internal networks (bots monitoring system status). Are bots a new thing? The idea behinds bots goes back 65+ years. In his 1950 paper Computing Machinery and Intelligence, Alan Turing laid out the idea behind what is now known as the Turing Test. A human and a computer would be interrogated entirely by text messages, and the interrogator wouldn’t know which was which. Turing argued that if the human interrogator couldn’t tell the human and the computer apart, we should call the computer intelligent, since we judge other people’s intelligence in exactly this way. 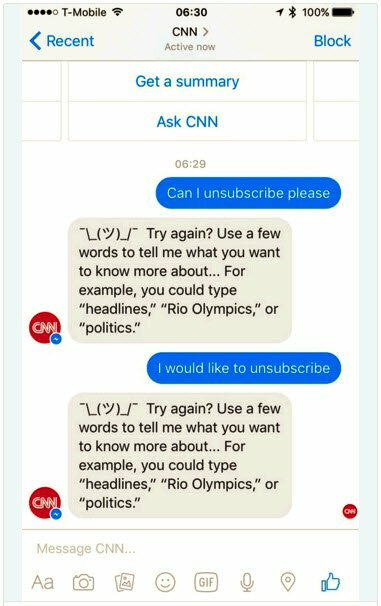 This kind of format and interaction model is really the canonical format for the term “chatbot”. The entire reason that the bot exists is to be chatted with, and there is no other goal of the interaction, besides seeing what the bot will say. This chatbot model went on to see some successes in 1966 with ELIZA, and in 1972 with PARRY, where both chatbots came close to passing the Turing Test. More recently, Cleverbot and Eugene Goostman have come close to passing. Three things – the capabilities, the addressable market, and a “newish” communication channel. The difference between the chatbots of the past (ELIZA), and the bots of the present and future, has much to do with the processing power and technology behind bots today. Specifically, because bots do all their processing server-side, that means they have enormous computing power at their disposal. Complementing this server-side processing power, we’ve seen massive advances in artificial intelligence and machine learning in the past few years. The combination of so much processing power and advanced AI capabilities is the fundamental shift between the chatbots of yesterday, and the bots of today. The size of the addressable market, as we’ve seen previously, is huge. Any time you have a channel that gives you access to upwards of a billion people, developers start to see dollar signs. 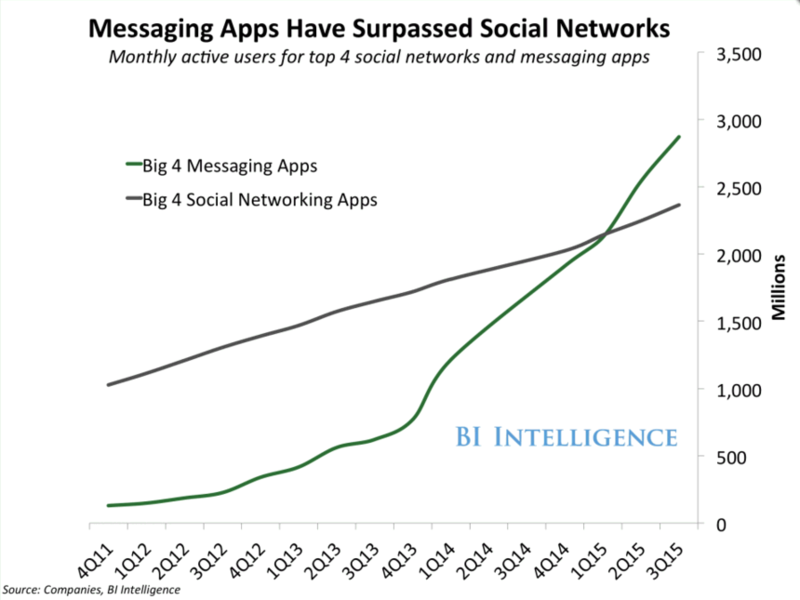 Finally, there is the lure of the last unpolluted channel of communication for most people – messaging. Usually, we only give our number to people we know and want to communicate with. As a result, the signal-to-noise ratio is very high in messaging – lots of messages from people we care about, very little spam. Bot developers need to pay strict attention to how their bot is perceived by the user in this (currently) uncluttered and personal space of messaging. If the bot is sending too many updates, demands too much interaction, or generally starts to feel spammy, people are going to rebel. There are lots of possible business models, but we haven’t reached product-market fit in the U.S. yet. We don’t yet have any stand-alone bots that consumers pay for, and describe a sustainable business by themselves. Some startups use bots as an ecommerce channel. ReplyYes has an ecommerce bot called The Edit that sends jazz fans suggestions of vinyl records they might like. Kip is a shopping bot that allows people like office managers to make large group purchases, and monetizes those sales on an affiliate basis. Other startups have bots that are being paid for on a software-as-a-service (SaaS) basis. x.ai has a bot that schedules meetings for you. This is essentially an always-on utility, so the company will charge users a monthly fee. Slacktodo has a bunch of Slack productivity tools, with access to the bundle charged monthly. Reading left-to-right, we can see that an individual user first has the choice of their preferred mode of interaction – simple text messages, text and voice, or voice-only. Next, the user’s choice of mode of interaction will dictate what platforms they have access to, and sometimes what the primary interface will be. For example, if they want a voice-only interaction, the choices are either Apple voice or Amazon Echo, and the first bot they interact with to navigate the space will be either Siri or Alexa, respectively. 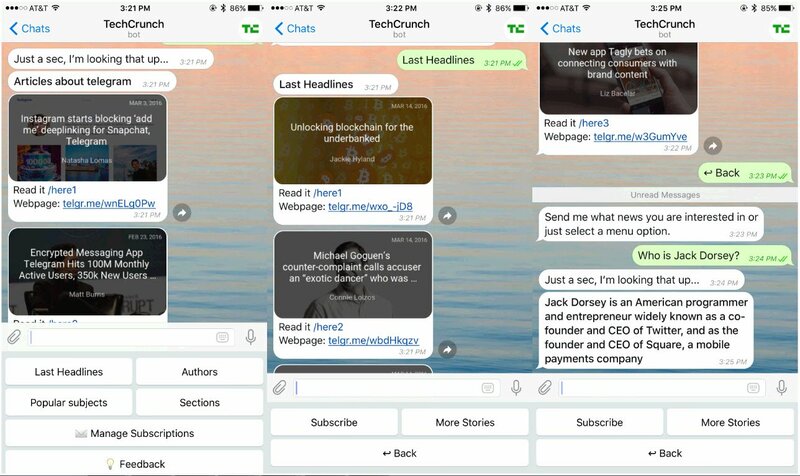 On the other hand, if a user picks a standalone messaging app like Telegram, the landscape opens up considerably. There isn’t a “gatekeeper” assistant, and the visitor has a different problem, which is bot discovery. 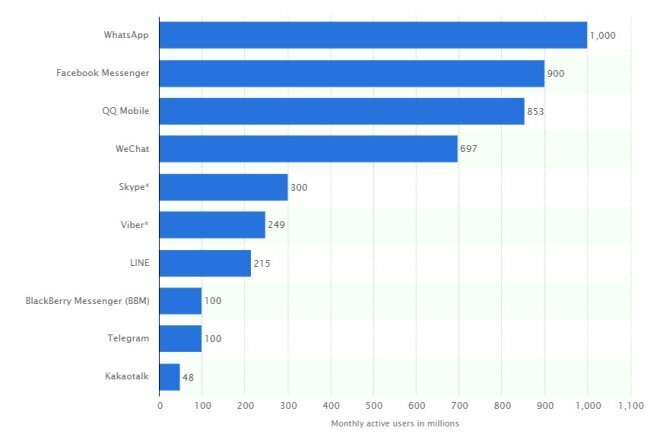 Some bot platforms have a “bot store” much like the App Store – the Slack App Directory is a great example. Users can see exactly what bots are available on the platform, and install them. Some companies are taking a platform-agnostic directory approach like Botlist where the list of bots is essentially hand-curated. Other companies like Chatbottle are taking a search-engine-like automated approach, building lists of bots, classifying them and ranking them according to a set of signals. The result is a list of bots ranked by popularity, and user feedback. Regardless, the next step is to choose a bot, and try it out. The graphic above makes it seem like the only real players in the space are big brands, but that’s not the case at all. There are all kinds of bots out there – Facebook Messenger claims 33,000 so far on its platform alone – so there are all kinds of possibilities for choosing the right bot for your specific needs. 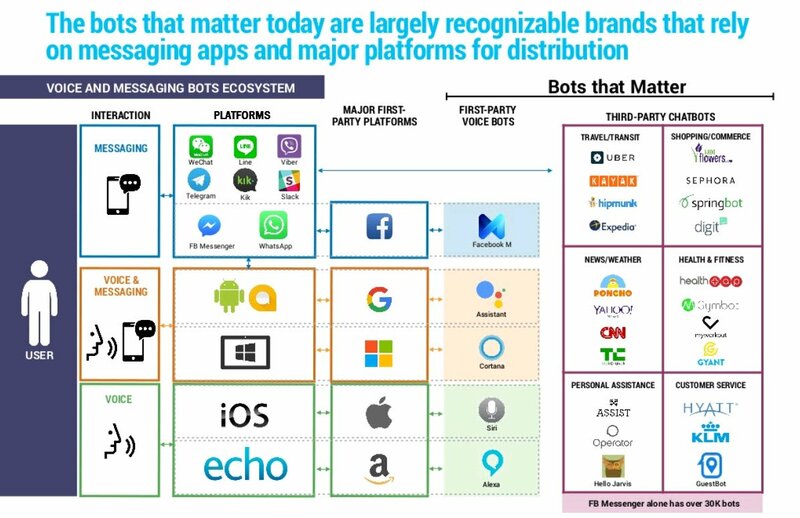 The bot landscape is complex and changing fast. But the fun part is that the space is so young that there are all kinds of discoveries still to be made – which bots work best for your needs, which platforms you prefer, etc. Jump in, and start playing around!